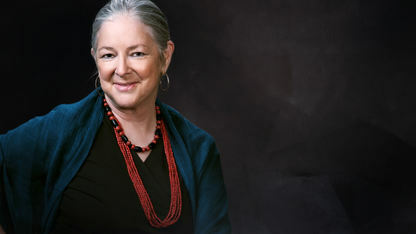 Considered "one of Native American literature's most highly regarded women writers"
Internationally known for her writing, Linda Hogan is highly decorated for her work in literature. She was born in 1947 in Colorado, but has strong Chickasaw roots in southern Oklahoma. Hogan received an M.A. in English and Creative Writing from the University of Colorado at Boulder. She writes from a Native American perspective and is considered "one of Native American literature's most highly regarded women writers." She has won multiple awards and accolades for her work. Hogan is considered to be an influential and provocative writer. Her stance often takes that of political ideology, with environmental and philosophical tones. Her writing often reminds readers that they need to be in tune with the natural world around them. She is active as an educator and speaker, has spoken at the United Nations Forum and was a speaker at the Environmental Literature Conference in Turkey in 2009. Hogan doesn’t limit herself to just her trade. She has also worked extensively with at-risk teens.